Work to bring HS2 to Sheffield could leave commuters facing more than five years of disruption, according to a presentation seen by the BBC. It claims roads and tram lines around the city's station would have to be moved to integrate the £55.7bn line. The documents also say a new platform will need to be built. HS2 say no significant remodelling will be needed, while Network Rail said since the "briefing note" was produced "there have been many discussions". It was announced in July that HS2 services would stop in Sheffield rather than at a station near Meadowhall as originally announced. According to the PowerPoint presentation, provided as part of a Freedom of Information request, the "station footprint would expand beyond current boundary to encroach the tram and road network". It adds: "Such an outcome is anticipated to drive infrastructure costs and lead to disruption of at least five years, requiring reconfiguration of both tram and road networks." The documents also suggests that to make way for HS2 one train an hour could be removed from the Dearne Valley line and impact on journey times between Sheffield and Leeds. Sheffield Midland station was redeveloped as part of £50m project in the mid-2000s that also involved changes to the road network, including the removal of Sheaf Square roundabout. A Network Rail spokesperson said: "This document was a briefing note for a working group and was not a completed report, which was produced as part of a dialogue with our stakeholders. "This note was produced in March and, since then, there have been many discussions. These conversations will continue as we consider how the railway will operate in the future." 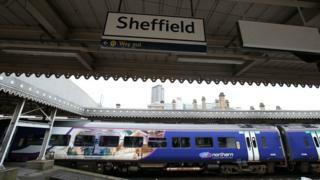 A HS2 spokesperson said: "Delivering the benefits of high speed rail to Sheffield Midland station will not require any significant remodelling works. "The platforms at Sheffield Midland station are already long enough to accommodate HS2 trains and there is capacity on the Midland Mainline, south of Sheffield, to support our proposal of a four-trains-per-hour service."